Operational Risk Management offers peace of mind to business and government leaders who want their organizations to be ready for any contingency, no matter how extreme. This invaluable book is a preparatory resource for when times are good, and an emergency reference when times are bad. 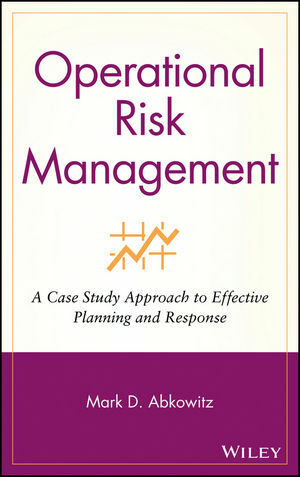 Operational Risk Management is destined to become every risk manager?s ultimate weapon to help his or her organization survive ? no matter what. Mark D. Abkowitz is former chair-man of Visual Risk Technologies, a risk management consulting firm. He is also a Professor of Civil and Environmental Engineering at Vanderbilt University. Dr. Abkowitz has served as chair of several national and international technical and advisory committees and currently holds a White House appointment as a member of the Nuclear Waste Technical Review Board. He is the recipient of the 1996 Distinguished Services Award from the National Academy of Sciences for his leadership role with the Transportation Research Board. He has written numerous articles and spoken at a variety of conferences on the subject of operational risk management, in addition to appearing on NPR, Fox News, and CNBC. Chapter 1. Why Do Disasters Happen? Chapter 2. Hyatt Regency Walkway Collapse. Chapter 3. Nightmare in Bhopal. Chapter 4. Meltdown at Chernobyl. Chapter 6. Challenger and Columbia: Déjà Vu. Chapter 7. Oklahoma City Bombing. Chapter 8. Aum Shinrikyo:Terror in Japan. Chapter 9. Attack on the USS Cole. Chapter 10. September 11: World Trade Center. Chapter 11. London1 Transit Bombings. Chapter 12. Wreck of the Edmund Fitzgerald. Chapter 13. Eruption of Mount St. Helens. Chapter 14. South Canyon Fire. Chapter 17. United Airlines Flight 232. Chapter 18. Alaska Pipeline and Denali Quake.